Maritzburg United will be looking for a second consecutive league win when they take on Platinum Stars in Rustenburg on Sunday (15h30). Stars claimed their second successive league win when they defeated University of Pretoria 1-0 away on Wednesday. The Rustenburg side has claimed 14 points from 10 home matches this season. Dikwena are placed 12th on the Absa Premiership log with 24 points from 21 matches. Maritzburg became just the second team to defeat Kaizer Chiefs this season when they claimed a 1-0 win at home in midweek. The KwaZulu-Natal side has claimed 10 points from as many away matches this season. Their next three league opponents are SuperSport United (home), Black Aces and Bloemfontein Celtic (both away). The Team of Choice is placed ninth on the Absa Premiership log with 27 points from 22 matches. In head-to-head stats, Stars and Maritzburg have met in 17 league matches since 2005/06. Dikwena have 10 wins compared to four for the Team of Choice, while just three matches have been drawn. 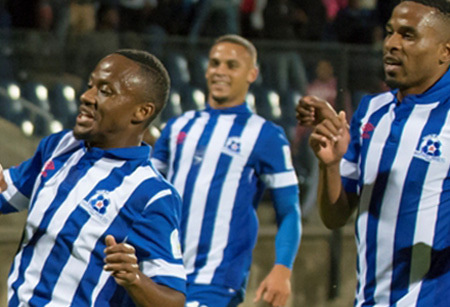 Stars have won five of their eight home matches against Maritzburg, suffering just one defeat in the process. When the teams met earlier this season, United claimed a 3-1 home win in Pietermaritzburg. Stars’ line-up from their 1-0 win over Tuks: Dambe, Mere, Tshikovhi, Sithole, Masenamela, Mathe, Madubanya, Nyanda (Makudubela 75'), Tshabalala (Moon 90+7'), Mabena (Kaunda 69'), Rodgers. Maritzburg’s line-up from their 1-0 win over Chiefs: Vries, Mabaso, Zulu, Mngomyama, Paintsil, Mkhize, de Jongh, Lentjies, Cele (Banda 81’), Mekoa (Sekotlong 74’), Anas (Mandaza 74’).